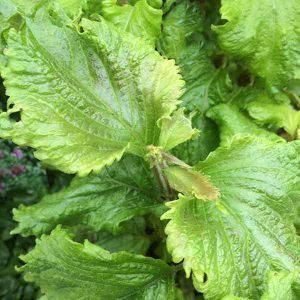 Known as Shiso cress also the Beefsteak plant as well as Perilla mint, this Japanese herb is easy to grow at home. In fact it can be little to easy. Two varieties are available, a green which is known as Aojiso and red which is known as Akajiso, to us they taste they same, like a spicy, minty, basil. Both have frilled leaves when mature. The botanical name is Perilla frutescens, it is a very useful herb, however if you let it go to seed, you may well have a little more Shiso than you bargained for. How do you use Shiso cress? 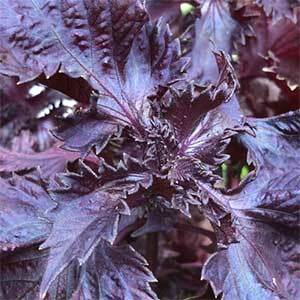 Traditionally Shiso is used in both Japanese and Korean cooking. It is commonly used with fish, especially sushi, where it is said to have a sort of preservative or medicinal property. Also used in pickles where the red variety add colour. You can grow them from seed as sprouts, and to us this is the best way. It can also be used in salads, as a tea especially a cool drink. It can also be dried and used as a seasoning. You can grow Shiso cress from seed or seedlings. Seeds are fairly easy to germinate as long as you surface sow them and keep them moist. They do need light to germinate. Seeds can be sown directly, if growing from seedlings, be careful not to disturb the roots when transplanting. The best time to plant it is from autumn through to late spring. Sequential sowing of seeds each month will ensure a continuous supply. We suggest watering with a liquid seaweed fertiliser every two weeks. Make sure that the soil does not dry out, although this is not much of a problem in winter to spring. You can grow Shiso cress in containers. And this is a great idea so you can more readily control the self seeding nature of the plant. KALLINYALLA NURSERY – Phone: 0428822725.